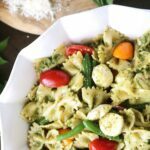 A creamy pesto pasta salad, featuring fresh and healthy ingredients like grape tomatoes and green beans. 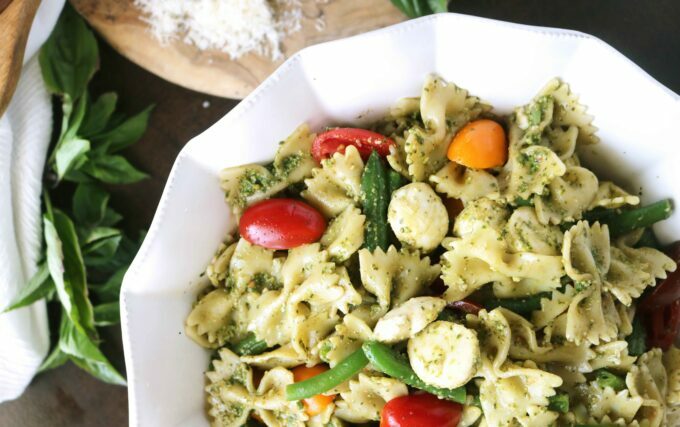 The summertime is such a perfect time to whip up a batch of Pesto Pasta Salad with Green Beans and Tomatoes, because well…all that good stuff is in season come the summer. Green beans, tomatoes, and basil are at their biggest and brightest (flavor-wise), and I say we take full advantage. This is the kind of pasta you don’t have to feel guilty about eating. 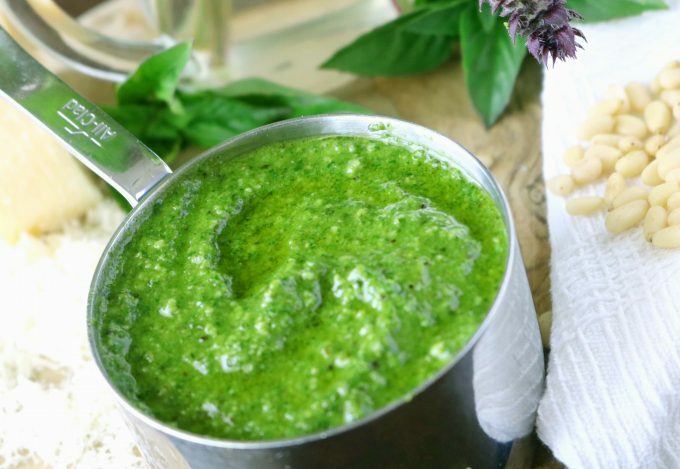 It features a creamy pesto sauce, made with fresh basil, buttery pine nuts (but, like, not the bad kind of butter), fresh Parmesan cheese and healthy Extra Virgin olive oil. The little grape tomatoes add a beautiful burst of acidity, while the green beans provide us with a little sweetness, and also some green, to make us feel even better about our healthy pasta salad indulgence. Next is some fresh Mozzarella, a low-fat, creamy cheese. 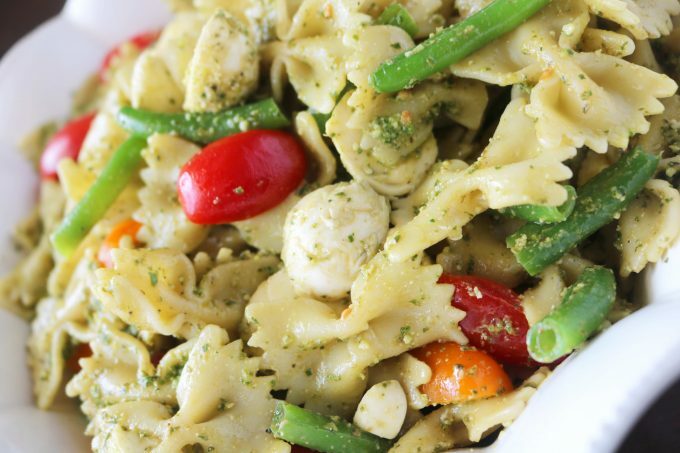 Throw in some bow-tie noodles for a little sustenance, and I’d say we are well on our way to creating a perfect and healthy pesto pasta salad. Serve Pesto Pasta Salad with Tomatoes and Green Beans any time of the day, at just about any temperature. It would be beautiful seated next to a bowl of scrambled eggs at your next brunch, as eggs and pesto pair wonderfully together. [Side Note: Any dish that can be made ahead of time, and served at room temperature is ideal for entertaining, making this pasta a win-win for your next gathering!] 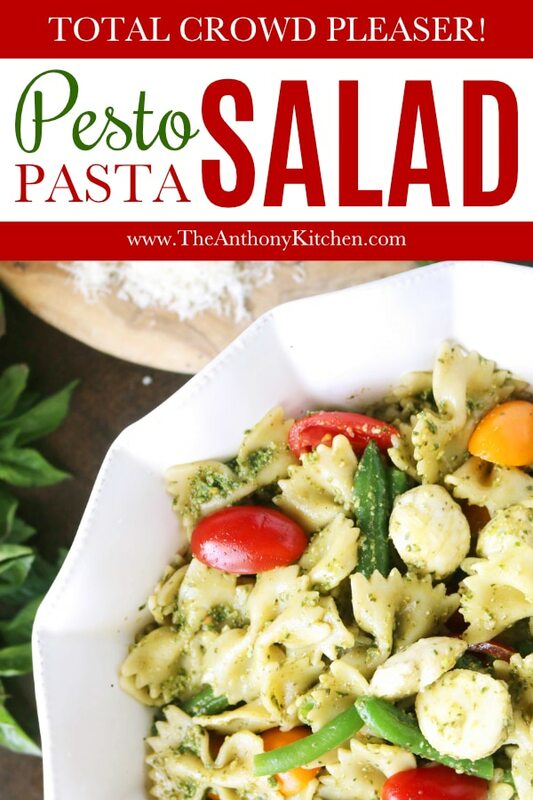 I also adore pesto pasta salad as a quick go-to for weekday lunches, and even as a dinnertime side dish paired with baked chicken or fish. You can serve this pesto pasta salad cold, but I really think it’s best at room temperature. If you like things on the warmer side, go ahead and heat it up to your liking. Have ready a large pot of heavily salted water and bring to a boil over high heat. Add pasta and cook to al dente according to package instructions. 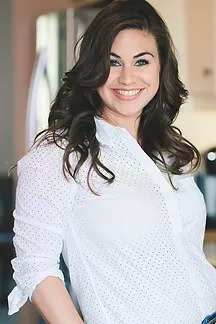 Strain over the sink and rinse with a stream of cool water to avoid overcooking. Set aside until ready to use. For the green beans, add water to a medium-sized saucepan until about two-thirds of the way full. Place over high heat and bring to a boil. Add green beans to water and allow to boil for 6 minutes, just until tender. Remove the heat, strain and rinse, once again, with a stream of cool running water to avoid further cooking. Transfer pasta and green beans to a large mixing bowl, along with the tomatoes, Mozzarella, pesto and salt. Gently fold ingredients together. Serve right away or refrigerate for up to 3 days.